The best part about updating an older home is the crazy uneven walls and ceilings, reconfigured wiring and past owners attempts at diys. 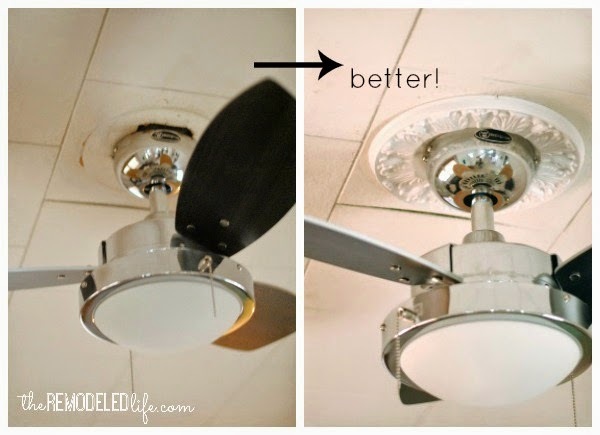 It makes a simple task, like updating a ceiling fan really fun. We went into this project thinking it would be a quick- out with the old, in with the new- less than and hour deal, but things aren't always what they seem. So first for a second, lets talk about ceiling fans. I know they are not everyone's favorite. 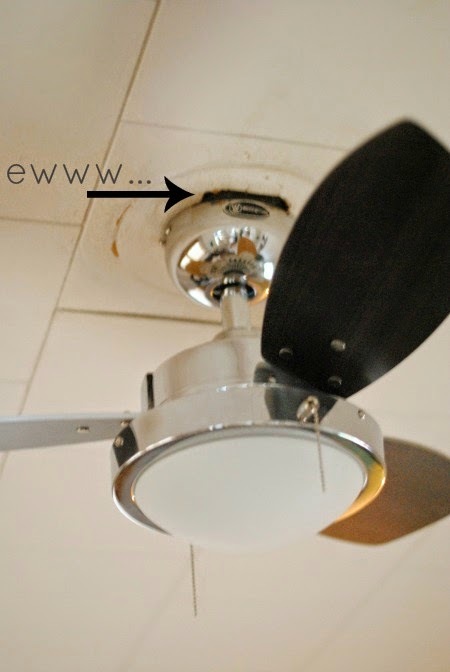 After living here for several years I realized I really enjoyed having a ceiling fan in our living room. The added refreshing air was quite pleasant. Are ceiling fans the prettiest? No, and the one we had was pretty awful. So I went on a search for a ceiling fan that wasn't atrocious, huge and not crazy expensive. 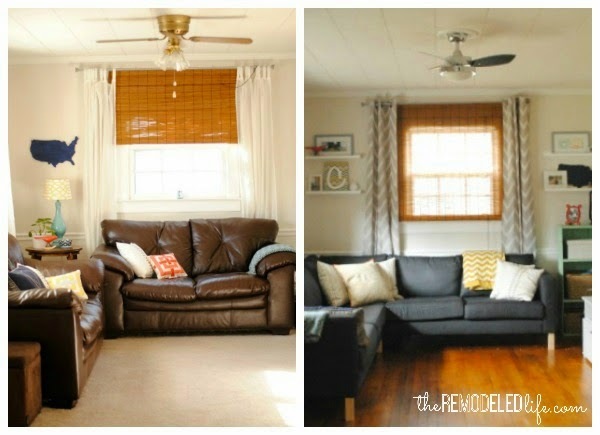 After weighing my options I chose a little modern styled fan I found on wayfair. Its small, but our living room is small so it works. The last thing I wanted was a big fan taking up all the precious space that we don't have. Something I have learned about updating your home is this - its your home, you are living in it, you know what you like, so go with that. Don't worry about sticking to design rules so much or going with the most trendy thing. After months of living with this little sweet fan, I still love it. Added bonus - I got this fan way less than the listed price. I stalked wayfair for months for a sale, then I signed up to receive emails to get 10% off my first purchase. So with the sale plus the 10% off it was less than $40. #Score. #It pays to be patient. Now lets talk about the frustrations of older home updates. As we excitedly took down the old clunker fan we began to realize something - well a few somethings. One, this fan didn't want to come down and was rigged up pretty oddly so a new one going in was going to be...not a quick fix. 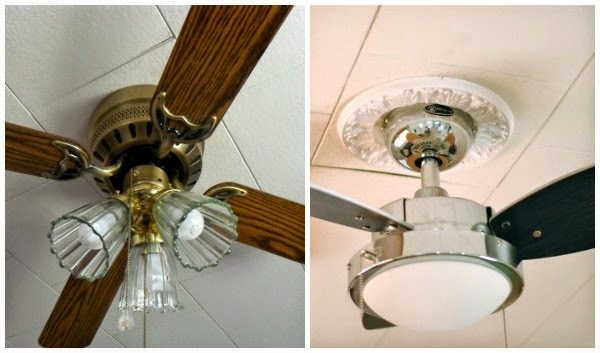 And two, our new little sweet fan was well, little and the old one had left behind quite the mark on our ceiling. We were glad to have our trusted friend Mark here to help us Justin with our wiring issue (lets face it, I just took pictures and freaked out about the big mark on the ceiling). This was a you hold this, while I do this kind of job. And, because of our ceiling debacle we actually had to do this twice. Yay! 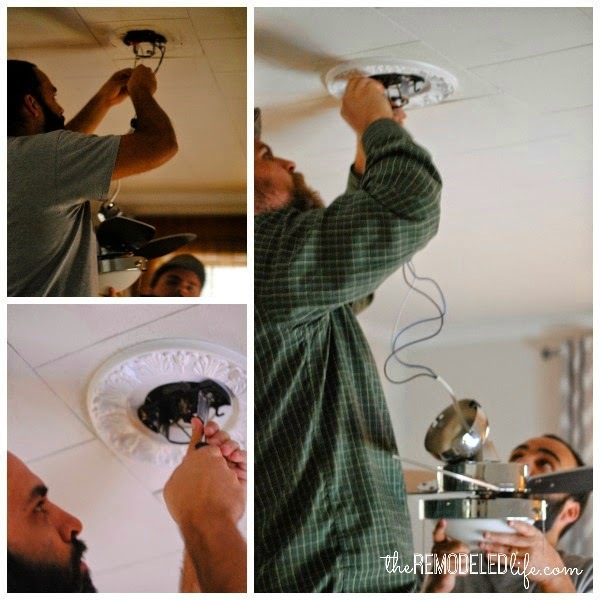 After we realized this was not going to look very good we decided to try the little ceiling medallion trick. And thankfully, it did the job of prettying this whole thing up. There were several options at our local hardware store, but I just wanted something on the smaller and quaint side. According to the kind lady at the store there is a method of calculating the proper ceiling medallion size for your room but that really didn't matter to me. I knew what I was looking for, who cares about rules. 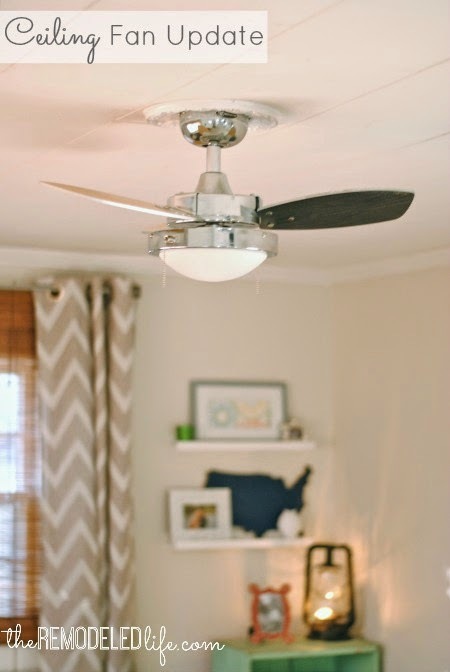 I actually really love the ceiling medallion and think it adds a little charm to the room - even if it is a ceiling fan. Old vs new...I like the new much better. Before, I felt like the ceiling fan was a big eye sore in the room, now it seems to fit - plus its functional so its a great mix for me. You would think that after all of these light fixture changes we would have known this would be more of a deal than we initially anticipated but we tend to forget in the excitement of it all. This is actually one of my favorite updates we have done in the whole house since it made such a big difference in the room. At the end of the day, it did take a little longer to complete but totally worth it.